Cowlitz County is located in southwestern Washington along the Columbia River, which marks the border with Oregon. The county has a population of about 102,500 people, making it the twelfth largest in the state. Cowlitz contains part of Mount Saint Helens in the Gifford Pinchot National Forest and part of the Cascade Mountain range. Not surprisingly, most of the county is quite rural. The county seat is Kelso and largest city is Longview; Longview is considered a part of the Portland-Vancouver-Salem metro area. Cowlitz is north of Clark County, Washington, and Columbia County, Oregon, and south of Lewis County, WA. Cities in Cowlitz include Longview, Kelso, Woodland, Kalama, and Castle Rock. In general, homes here are older than the Washington state average and have typical commutes of under half an hour. 3 Beds | 2 Baths | 1350 sq. Ft.
4 Beds | 1.5 Baths | 2440 sq. Ft.
4 Beds | 2.25 Baths | 2332 sq. Ft.
4 Beds | 2.5 Baths | 2194 sq. Ft.
2 Beds | 1 Baths | 927 sq. Ft.
4 Beds | 2.5 Baths | 2059 sq. Ft.
Blue Summit Realty has the most accurate and up to date Cowlitz County real estate listings on the web. Currently there are 168 homes for sale, 4 condos for sale, 12 rental properties, and 235 vacant land properties in Cowlitz County. Of the 424 total Cowlitz County residential listings for sale 9 are bank owned, 0 are short sales and 35 are new construction and 1 are townhomes. The price ranges from $60,300 to $1,200,000 with a median list price of $353,098 and median sold price of $264,693. Make sure to refine your Cowlitz County real estate search by property type, price, square footage, bedrooms, bathrooms and more with the search tool above or view the Cowlitz County listings on our interactive map. 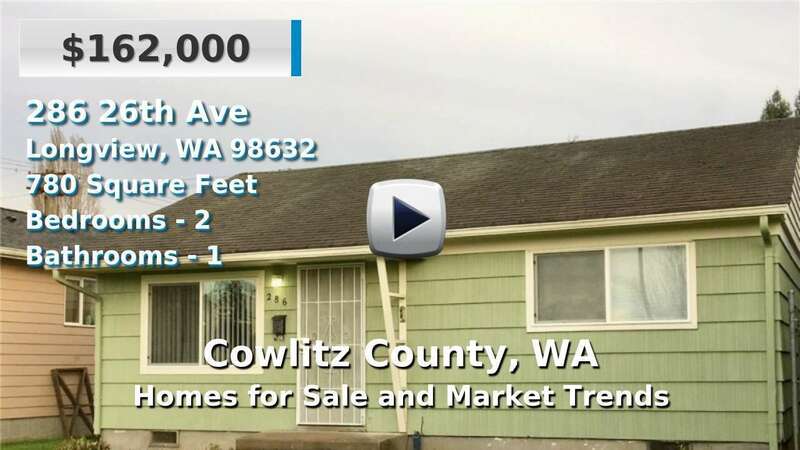 Our Cowlitz County real estate listings were updated 11 minutes ago.